Numerous references are made in the biblical text to the Hittites. You will remember that Abraham bought the cave and the field of Macpelah from Ephron the Hittite, as a burial place for his family (Gen. 29:49). Hundreds of references are made to Egypt and the Egyptians. The oldest known treaty between two nations is the “Kadesh Treaty,” an agreement between the Hittites and the Egyptians. You may be surprised to learn that until fairly recently, many skeptics ridiculed biblical references to the Hittites, saying there was no such people, and the biblical writers were inventing fiction. Now so much information is available on the vast Hittite empire that doctoral degrees may be earned in Hittite studies! Archaeology has helped to show that the culture, persons, and events of the Old Testament are trustworthy. Archaeology has done much to further the cause of showing the reliability of the OT. Where there were alleged missing persons mentioned in the OT, but not known from external sources, such as King Sargon in Isaiah 20:1, or Governor Sanballat of Samaria (Neh 2:10), or kings David, Ahab, Jehu, and Hezekiah, Menahem, and even a prophet, Balaam, in each case spectacular finds have vindicated the claims of the OT. In like manner, where the OT claimed there were peoples such as the Hittites or the Horites, later finds vindicated the presence of these as well as other allegedly missing peoples. 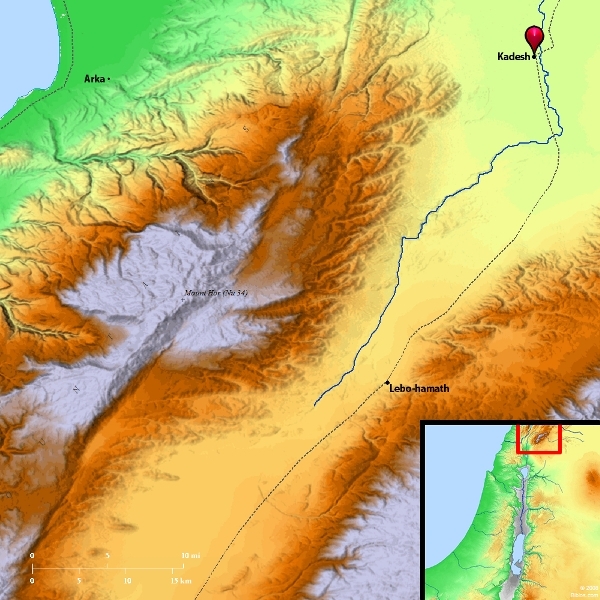 The treaty is called the Kadesh Treaty, as Kadesh (sometimes spelled Qadesh) on the Orontes River was the battle site for these two major forces in 1274 B.C. See map here for location of Kadesh. Both the Hittites and the Egyptians wrote their own version of the battle, each suggesting a more favorable outcome for their respective country; this is especially true of the Egyptian version. Most scholars believe the battle was a stalemate. 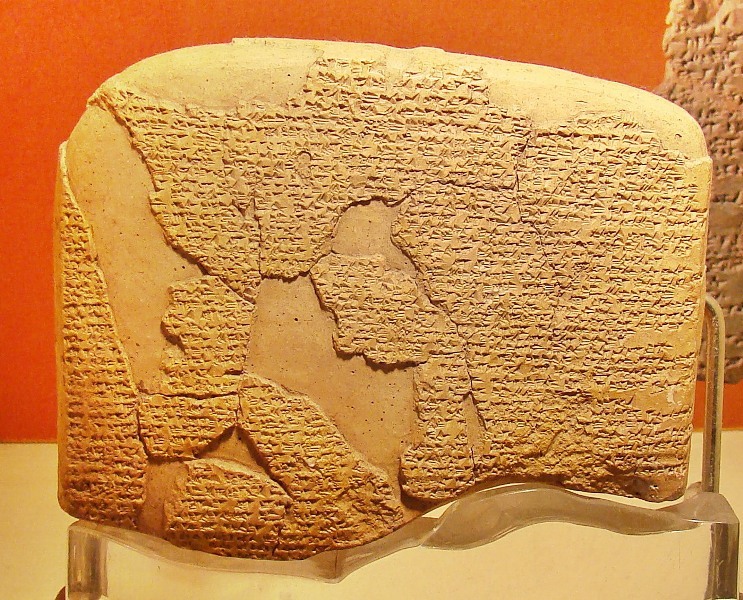 Pictured below is a photo of the Kadesh Treaty, written in Akkadian, in Istanbul’s Archaeology Museum. The king of the Hittite Empire was Hattusilis III; the Egyptian king was Rameses II. In summary, the treaty states that neither of these nations would battle one another. Further, if another nation were to attack either of them, they would rise to their assistance against the aggressor. Remember to left-click on images for higher resolution. 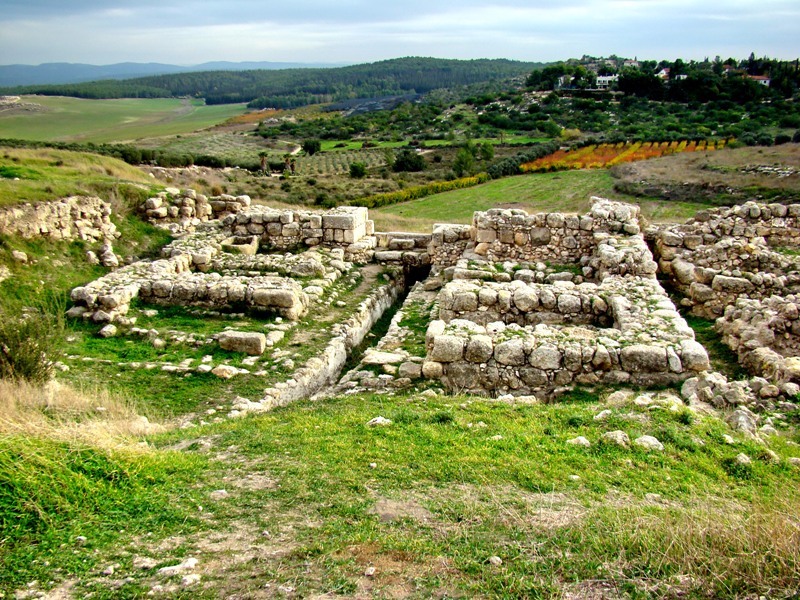 Gezer was a major metropolis in ancient times. It overlooked and dominated the Via Maris (or Way of the Sea), a major highway between Egypt and Mesopotamia. At 700 feet above sea level, Gezer commanded a magnificent view in every direction. Thus it controlled not only the main highway but also the principal trunkline that branched off to Jerusalem. This was one of the most important crossroads in the country. (Biblical Archaeology Review, May/June 1994). This is one of the most impressive archaeological sites in Israel, yet it is rarely visited even by aficionados because it is so difficult to get to—unmarked and neglected. The high place consists of ten monumental standing stones dating from the Canaanite period (about 1600 B.C.) that probably retained their now-mysterious religious significance for hundreds of years thereafter. Does each of these huge standing stones represent a tribe? Or a city? Were they placed here as witness to some kind of covenant? (ibid.). 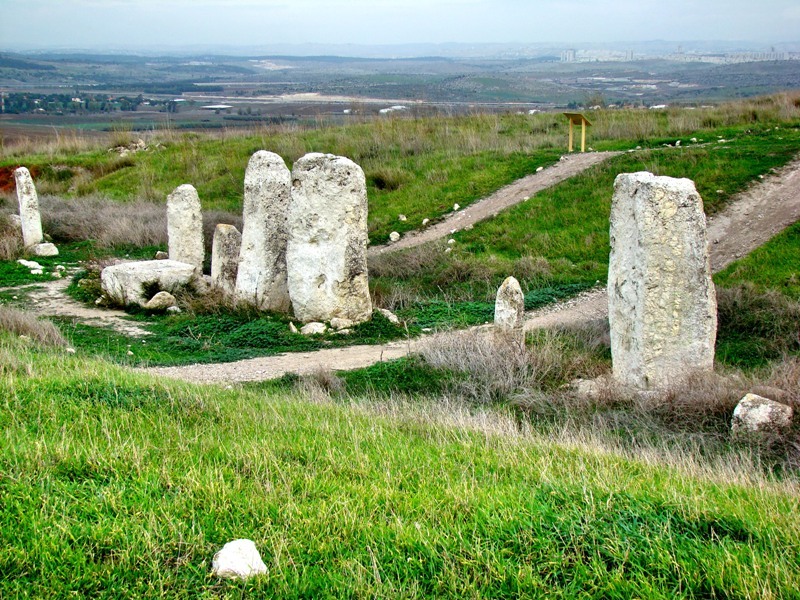 Today’s photo shows the standing stones at Gezer. This high place was located at the highest point in the city. Scholars believe that this high place dates back to Canaanites occupation (1500 B.C.). While some suggest that these stones, some of which are more than nine feet high, were erected to signify treaties between nations, others believe this was a cultic center. The site brings to mind Lev. 26:1: “You shall not make for yourselves idols, nor shall you set up for yourselves an image or a sacred pillar [Heb. matstsebah], nor shall you place a figured stone in your land to bow down to it; for I am the LORD your God” (NASB). Our previous post featured a photo of one of Gezer’s boundary stones. We noted, “Excavations (1964–73) have uncovered a six-chambered gate and defenses” (NBD). Pharaoh king of Egypt took Gezer from the Canaanites and gave it as dowry for his daughter, who became Solomon’s wife (1 Kings 9:16). Because of its strategic location in the Shephelah in the south, Solomon made it a fortress city. The six-chambered gate referenced in the NBD article was characteristic of Solomon’s other fortress cities, such as Hazor and Megiddo (both also strategically located). 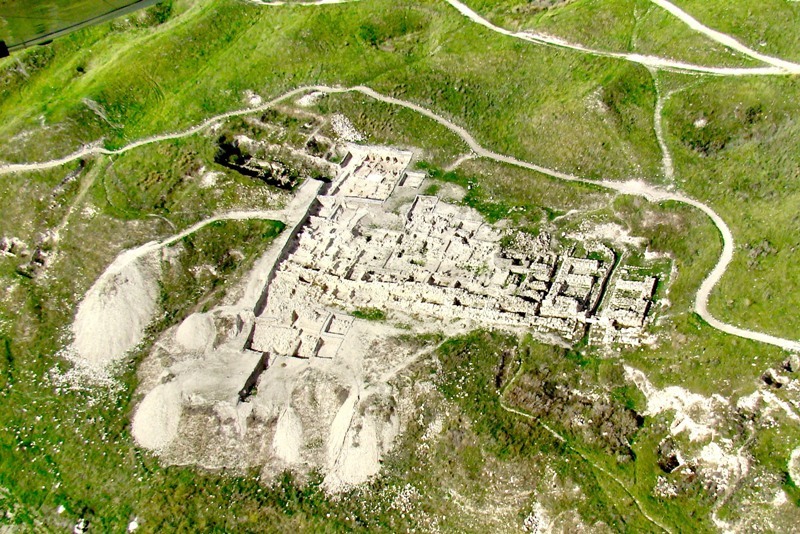 This aerial photo shows the tel of Gezer from the south looking north. 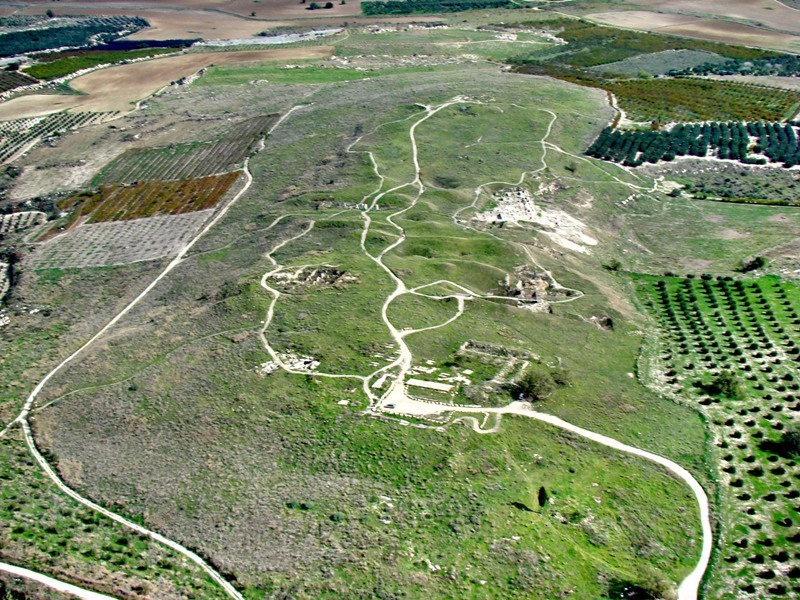 Gezer Aerial Overview. Photo by Leon Mauldin. In the right center in photo below you can see the 6-chambered gate. Gezer Aerial Detail. Photo by Leon Mauldin. This shows the gate at ground level. You can see the central hill country in the background. Gezer Six-Chambered Gate. Photo by Leon Mauldin. 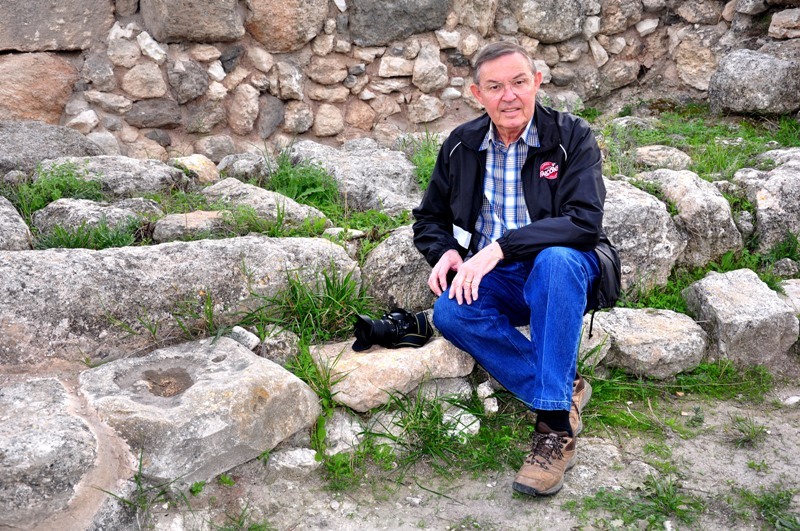 Ferrell Jenkins at Gate at Gezer. Photo by Leon Mauldin. One of the chief cities of pre-Roman Palestine from at least 1800 BC. It is strategically located on the road from Jerusalem to Joppa, on the most N ridge of the Shephelah overlooking the Ayyalon valley, and 12 km from the main highway between Egypt and Mesopotamia. Pharaoh Thutmosis III captured the Canaanite city in c. 1468 BC. Ten el-AMARNA letters from Gezer show the city vacillated but finally remained loyal to Egypt in the 14th century BC. At the time of the Hebrew conquest its Canaanite king, Horam, tried to help Lachish but was defeated (Jos. 10:33; 12:12). Gezer, however, was not taken by the Israelites (Jos. 16:10; Jdg. 1:29). Even so the city was included in Ephraim’s territory as a Levitical city (Jos. 21:21). Soon after the conquest Pharaoh Merenptah claims, on his stele, to have recaptured it. Archaeological evidence indicates that after 1200 BC the Philistines controlled the city, possibly with Egyptian approval, which may explain David’s battles in this region (2 Sa. 5:25). Gezer became an Israelite possession when the Egyptian pharaoh gave it to his daughter on her marriage to Solomon, who rebuilt the city and its defenses (1 Ki. 9:15–17). Excavations (1964–73) have uncovered a six-chambered gate and defenses. The Biblical Archaeology Review (July/August 1983) observes that the city of Gezer was one of only a handful of biblical cities identified by an inscription found at the site. In the case of Gezer there were eleven boundary stones found, nine of which contain the words, “Boundary of Gezer.” Most of these are bilingual, written in both Hebrew and Greek (see Dictionary of NT Background, entry on “Epigraphy”). 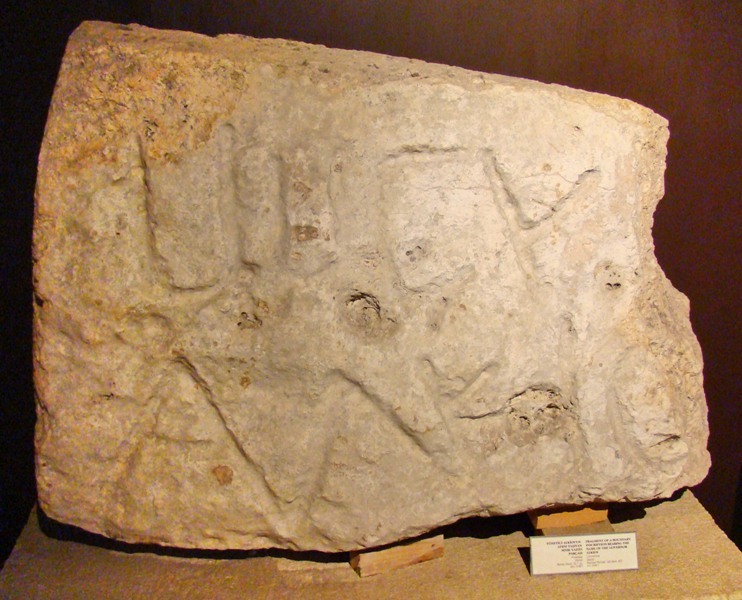 Today’s photo features one of the Gezer boundary stones which is located in the Archaeological Museum at Istanbul. When you study the Bible, you are not reading fiction. It deals with real places, real people, and real events. Discoveries such as these boundary stones reinforce the factual nature of Scripture. King Hezekiah was one of Judah’s best kings. He faithfully led the nation in very difficult times. Then he became sick and was near death. God sent the prophet Isaiah to Hezekiah with the message, “Set your house in order, for you shall die and not live” (Isa. 38:1). Hezekiah fervently prayed to the Lord, his prayer was heard, and the Lord promised to add 15 years to his life. As a sign to confirm this promise, God said, “Behold, I will bring the shadow on the sundial, which has gone down with the sun on the sundial of Ahaz, ten degrees backward” (Isa. 38:7,8, NKJV). 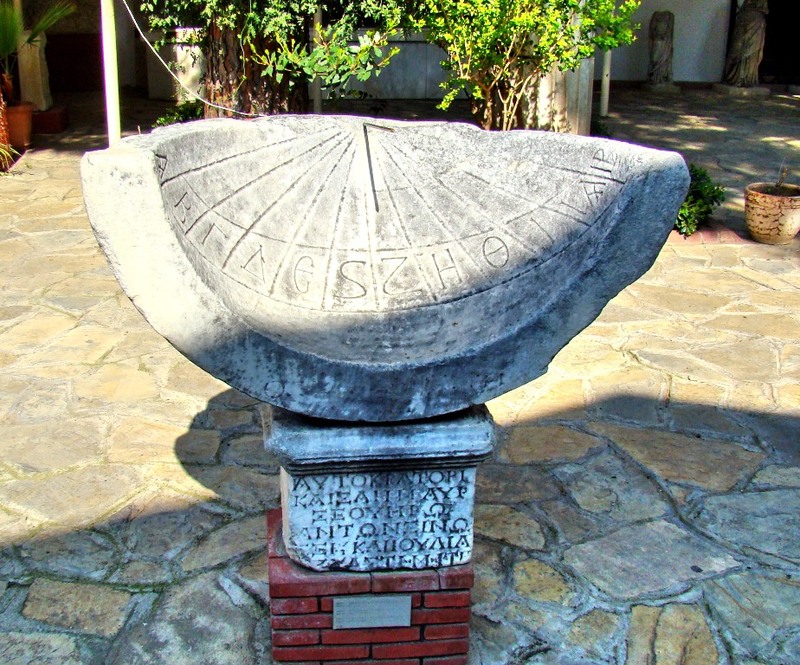 Today’s photos feature a couple of ancient sundials. Sundial. Archaeological Museum, Istanbul. Photo by Leon Mauldin. 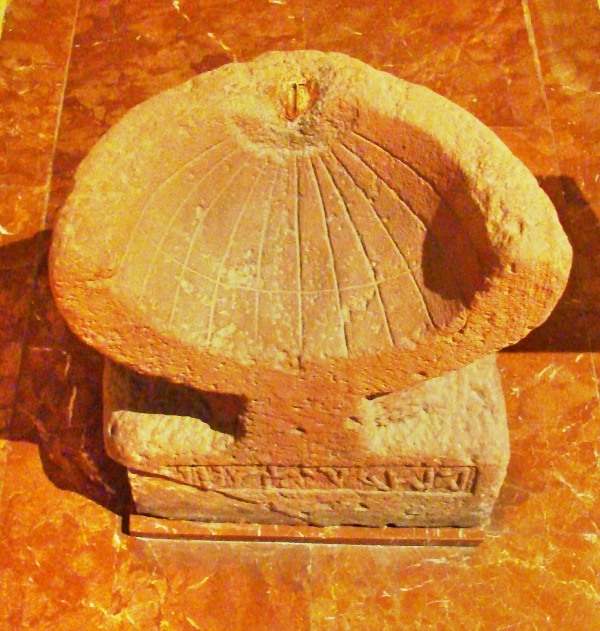 This sundial is housed in the Archaeological Museum in Istanbul, and is dated as 1st century B.C. The accompanying sign has this info: The concave inner side of the half dome shaped dial is divided into twelve parts by eleven radial lines. The rod, perpendicular to the center, is the pointer. The shadow of the pointer falls on the radial lines as the sun moves. Although the system of dividing the time passing between sunrise and sunset into twelve equal units was used in Mesopotamia as early as the Sumerian times this type of dial is known as the Babylonian dial. The rod referenced above is missing from this sundial. But you can see the rod in the sundial below, casting its shadow. This artifact is located in the Ephesus Museum. Sundial. Ephesus Museum. Photo by Leon Mauldin. Whether what is intended in Isa. 38 is this type of sundial, or another system (steps, stairway) is meant, the principle is the same. God miraculously returned the shadow to confirm to Hezekiah that He would extend his life as He had promised. Nelson’s New Illustrated Bible Manners and Customs informs us that in Nebuchadnezzar’s original arrangement in Babylon, “…a section of paved road over two hundred yards long led into the Ishtar Gate. 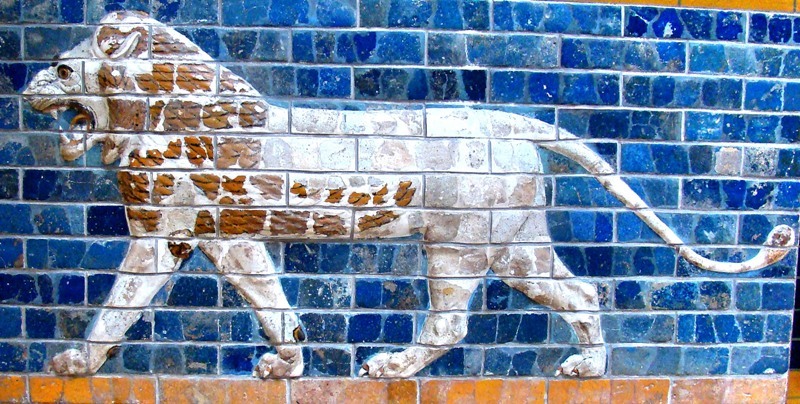 On either side of the roadway lions (sixty on each side), symbols of Ishtar, in molded glazed brick, in red, white, and yellow, lined the walls. The roadway still contains the paving stones inscribed with Nebuchadnezzar’s dedication” (p. 309). Today’s photo shows one of the panels of glazed bricks, depicting a lion. Babylon Ishtar Gate Lion. Istanbul Museum. Photo by Leon Mauldin. “The excavator Koldewey carried off to Berlin many bricks from the Ishtar Gate and the approach to it, and a diminutive gate with its approach has been recreated in the archaeological museum in Berlin. Anyone who walks through this part of the museum can imagine himself as Daniel or Ezekiel walking into Babylon to meet Nebuchadnezzar. Panels of these sacred animals are also on display in the archaeological museums in Baghdad and Istanbul and the Metropolitan Museum in New York” (ibid.). Such displays may give us a glimpse of the splendor and beauty of ancient Babylon. It gives us some insight into Nebuchadnezzar’s boast: “The king uttered these words: ‘Is this not the great Babylon that I have built for a royal residence by my own mighty strength and for my majestic honor? '” (Dan. 4:30, NET). The mighty monarch learned that “the Most High rules the kingdom of men and gives it to whom he will and sets over it the lowliest of men” (Dan. 4:17, ESV), when God humbled him. “He was driven from human society, he ate grass like oxen, and his body became damp with the dew of the sky, until his hair became long like an eagle’s feathers, and his nails like a bird’s claws” (v. 33). When he realized that God is sovereign, and that he reigned only because God permitted it, then he again ascended the throne. He praised God saying, “But at the end of the appointed time I, Nebuchadnezzar, looked up toward heaven, and my sanity returned to me. I extolled the Most High, and I praised and glorified the one who lives forever. For his authority is an everlasting authority, and his kingdom extends from one generation to the next” (v.34). Today completed our biblical study tour of Turkey and Greece, as we have traveled in the steps of Paul and John. Our flight is to leave early tomorrow (Mon) morning. We have all profited from the trip, and our understanding of Scripture in its historical and geographical context has been enhanced. 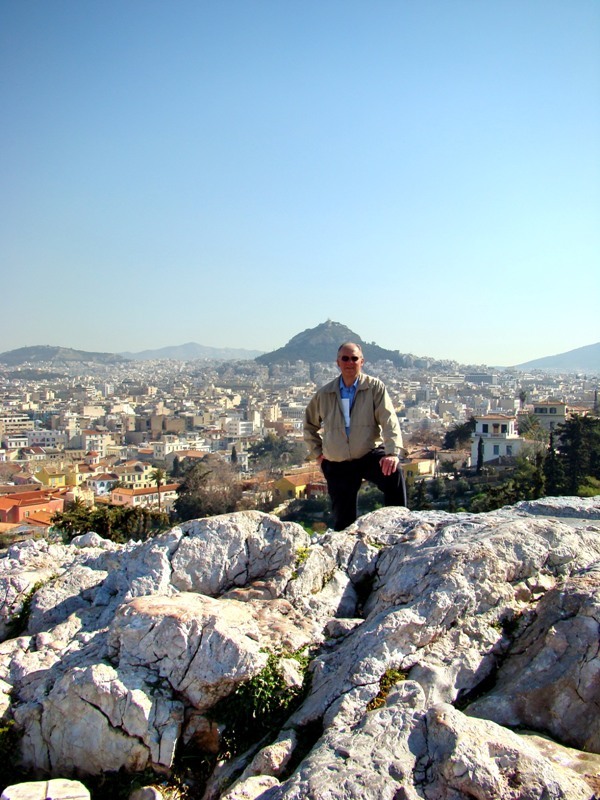 On Friday our group stood on Mar’s Hill in Athens. During the 2nd Missionary Journey, it was in this area that Paul addressed the Stoic and Epicurean philosophers. While an invitation to speak to them sounded potentially promising (Acts 17:19), Luke informs us, “For all the Athenians and the foreigners who were there spent their time in nothing else but either to tell or to hear some new thing” (v.21). It turned out that these people who were looking for novelty were not looking for truth. Paul wrote of those who are “always learning and never able to come to the knowledge of the truth” (2 Tim. 3:7). Sadly, when Paul spoke of the resurrection of Christ, the Athenians mocked (Acts 17:32). A few responded favorably, but the message of the Gospel was quickly dismissed by most of the hearers there. Today’s photo shows the Areopagus (Mar’s Hill), which is situated slightly below the acropolis. Ares was the Grecian mythological god of war; “pagos” means “a rocky hill.” Thus Areopagus means the “Hill of Mar’s; hence, Mar’s Hill. Areopagos (Mar's Hill) at Athens. You are currently browsing the Leon's Message Board blog archives for March, 2010.